The Server Plan is ideal for growing companies of all sizes that are looking for a full featured PBX and business VoIP solution, without the cost and hassle of premise based hardware alternatives. The Server Plan features a dedicated server or a cluster of servers running the reliable and capable Asterisk PBX software and managed by PBX Authority for you. The Server Plan is a Premium plan that offers a perfect replacement option for legacy installed PBX systems. Eliminate the hardware and software costs, not to mention the on-site PBX maintenance contracts, and realize all the quality, capabilities and value of managed communication services. This plan is perfect for companies with one or multiple offices, mobile workers and unique feature requirements. 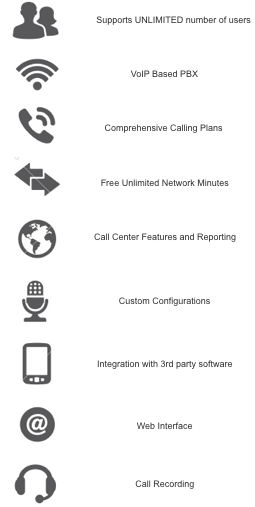 All Hosted PBX and VoIP standard features and more including ability to connect to third party technologies such as Outlook, Salesforce.com and Sugar CRM.